An exceptionally close supernova (a stellar explosion, see Section 13.2, p. 337) discovered on January 21, 2014, has become the focus of observatories around the globe, as well as a suite of orbiting spacecraft. 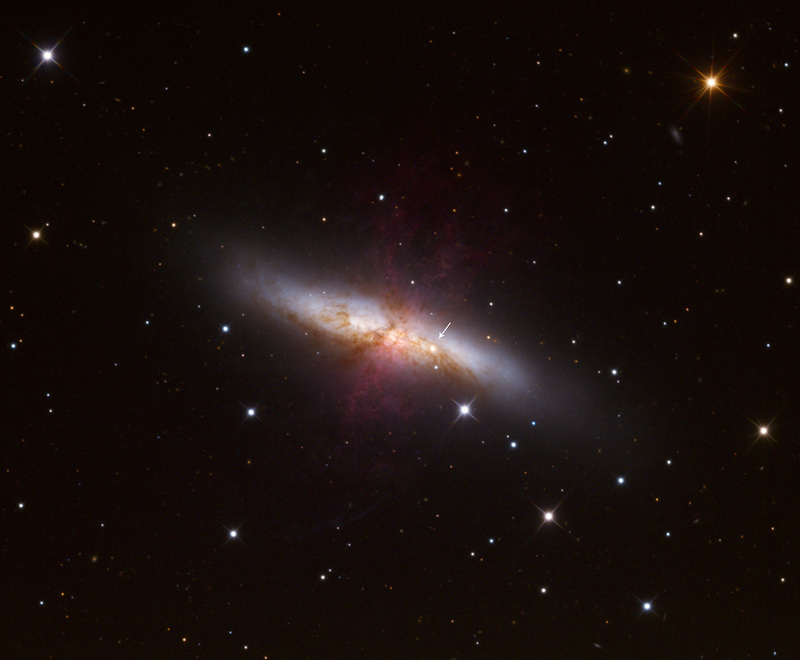 The blast, designated SN 2014J, occurred in the bright galaxy M82 and lies about 12 million light-years away. This makes it the nearest optical supernova in two decades and potentially the closest type Ia supernova to occur during the life of currently operating space missions. Credit and copyright: Adam Block, Mt. Lemmon SkyCenter, U. Arizona. SN 2014J was first spotted as an unfamiliar source in the otherwise familiar galaxy by teaching fellow Steve Fossey and astronomy workshop students Ben Cooke, Tom Wright, Matthew Wilde, and Guy Pollack at the University College London Observatory on the evening of January 21. To capitalize on this unusual event, astronomers have planned observations with the NASA/ESA Hubble Space Telescope and NASA’s Chandra X-ray Observatory, Nuclear Spectroscopic Telescope Array (NuSTAR), Fermi Gamma-ray Space Telescope, and Swift missions. Links: Further information from the NASA press release; hi-res image from APOD January 24, 2014. NASA budget implies choices: Cassini or Curiosity? This spring, NASA officials will conduct a review of the spacecraft that have outlived their original missions. For the 2015 fiscal year, which begins October 1, the agency faces particularly tough choices, in order to balance their books. A decade after swinging into orbit around Saturn, the venerable Cassini spacecraft is still working, well beyond the four years of science the space agency had hoped to get. But the spacecraft is running low on maneuvering fuel, and its managers want to end with a scientific bang – an ambitious agenda that includes 22 orbits through a gap between the planet and its innermost ring before sending the craft on a death plunge into Saturn in 2017. For several months, however, scientists have worried that NASA, financially squeezed like the rest of the federal government, could terminate the mission sooner. The Mars rover Curiosity, which will cost $68 million this year to operate, will complete its two-year primary mission in June 2014, so money for continued roving will come out of funds dedicated to “extended missions.” For this year, that amount is $140 million, which includes $58 million for Cassini. Other extended missions include the Messenger spacecraft at Mercury, the Mars rover Opportunity, and the Mars Reconnaissance Orbiter. No one expects NASA to turn off Curiosity, which will not even arrive at its primary science destination until later this year, raising concerns that Cassini may be on the chopping block. More recently, NASA planetary science director James Green told scientists that the perception of Cassini versus Curiosity was inaccurate and that officials could instead scale back the cost and scope of the extended missions. The agency could also juggle other money to pay for both Cassini and Curiosity, but that could have consequences like delaying future missions, which themselves are under pressure to deliver the maximum scientific benefits for a smaller cost. Links and source: NY Times op-ed by Kenneth Chang. On p. 25, Figure It Out 2.3, the last paragraph (about Joseph Fraunhofer) belongs at the end of the caption of Figure 2-4 on p. 26. The innermost moon of Mars, Phobos, is seen in a new 40-second movie in full 360-degree glory. The images were taken by the High Resolution Stereo Camera (HRSC) on ESA’s Mars Express orbiter at various times throughout the mission’s 10 years. The moon’s parallel sets of grooves are perhaps the most striking feature, along with the giant 9 km-wide Stickney impact crater that dominates one face of the 27 x 22 x 18 km moon. The origin of the moon’s grooves is a subject of much debate. One idea assumes that the crater chains are associated with impact events on the moon itself. Another idea suggests they result from Phobos moving through streams of debris thrown up from impacts 6000 km away on the surface of Mars, with each ‘family’ of grooves corresponding to a different impact event. Mars Express has imaged Phobos from a wide range of distances, but made its closest flyby yet on December 29, 2013, at just 45 km above the moon. Although this is too close to take images, gravity experiments will give insight into the interior structure of Phobos. Links: ESA movie; Phobos overview and gallery from NASA.